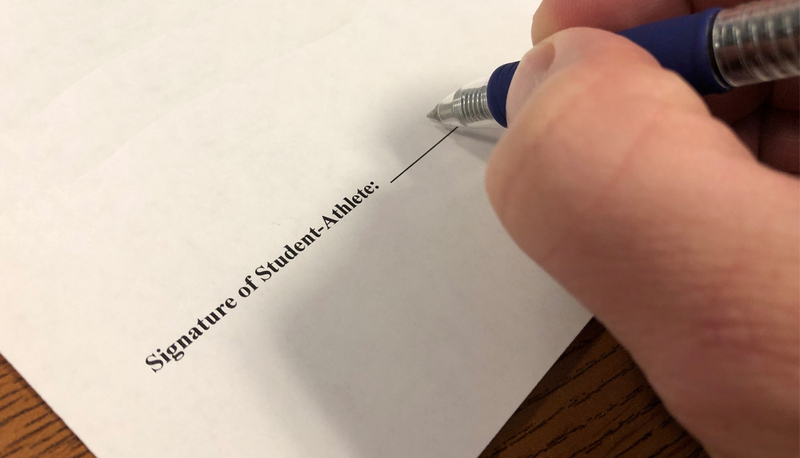 Here’s a look at some of the student-athletes signing their National Letters of Intent this week. Cleveland High School’s Dion Hunter committed to play football for the University of New Mexico. Hunter was a linebacker on the Storm’s 12-1 squad this past season. 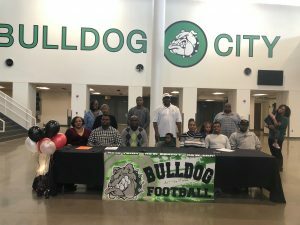 Albuquerque High’s Savion Andrews and Christian Carreathers will both play in-state football at the next level. 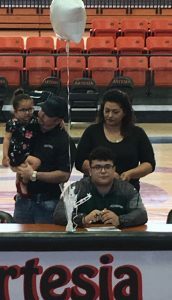 Andres signed with Eastern New Mexico University and Carreathers will play at New Mexico Military Institute. 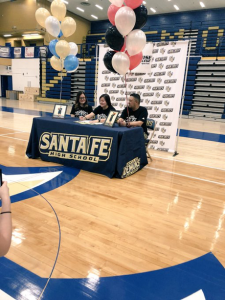 Also at Las Cruces High School this week, Mindy Tapia will sign her national letter of intent to play soccer at Texas Tech. La Cueva High School had three football players sign letters of intent. 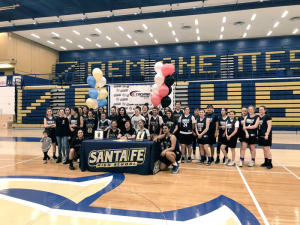 Blaine Smith will play for NMMI, Fred Mady III is going to Fort Lewis College in Durango and Kendrick Milford is going to Eastern New Mexico University. 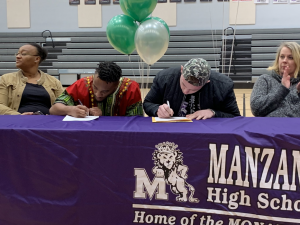 Manzano High School put four athletes at the table to sign on Wednesday. Xavier Ivey-Saud and Austin Walker will both play football at Eastern New Mexico University. 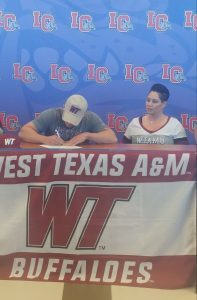 Their teammate Jack Blakenship is going to Western New Mexico University. 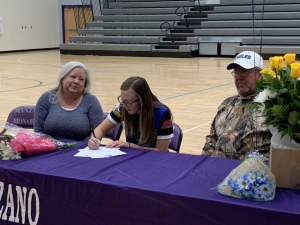 Jaden Titus signed a letter of intent to play softball at Southwestern Christian University in Oklahoma. 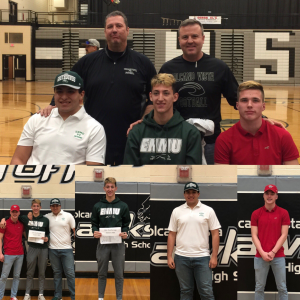 The Volcano Vista Hawks are recognizing several of their student athletes going to play at the next level. Hope Christian all-around athlete Vince Quezada will be a preferred walk-on with the New Mexico State football team. 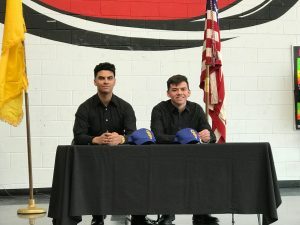 Rio Grande High School’s Aaron Pavia (QB) and Cruz Bolivar (WR) will both be attending the College of St. Scholastica in Duluth, Minnesota to play football. Dominic Morgan of St. Michael’s will play football for Ave Maria University in Florida. They are known as the Ave Maria Gyrenes, a mascot defined as a member of the U.S. Marines. 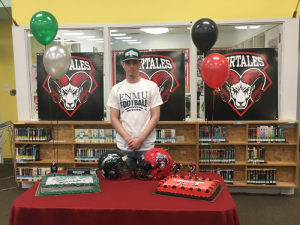 Portales High School senior Julian Urioste will sign to play football at Eastern New Mexico University. 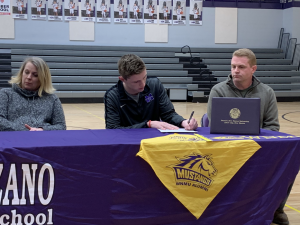 Silver High School’s Tristin Moore signed a letter of intent to play basketball in his backyard at Western New Mexico University. 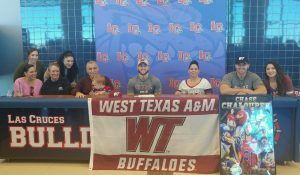 The Artesia Bulldogs have two football players who signed their letters of intent. 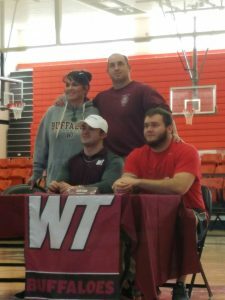 Colin Flood will play for West Texas A&M University and Isaiah Farmer is headed to Eastern New Mexico University. Del Norte Knights quarterback Christian Mejia will sign with New Mexico Highlands. Bloomfield’s Angelo Atencio will sign with Eastern New Mexico for football. 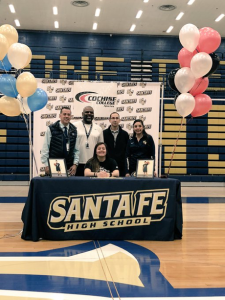 Santa Fe High School’s Taylor Salazar will play basketball at Cochise JC. 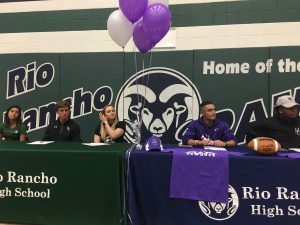 Rio Rancho High School had several students commit to compete at the next level.